I'm actually ashamed that I haven't posted a real fashion post since March! That's so crazy to me. If you missed my fashion post I promise that they are back for good because I missed my passion for fashion. Now that we got that out of the way, let's get into this leopard print blazer. Y'all, I didn't know my leopard print obsession would escalate the way it did, but I currently want everything leopard print. After seeing this blazer I'm seriously like what else can I get leopard print. If you haven't been paying attention to the trends, animal print is here for the Fall honey. Everything I've seen that is animal print is sooo good. It's making me eager to shop for Fall fashion. Some people hate fast fashion trends, but animal print can never go out of style. If you ever wanted to invest in a good animal print blazer then the time is now. The Best Animal Print Pieces For Fall 2018! I purchased this jacket from Topshop. They don't have it in store anymore, but it's on the website! I'm wearing a size 2 and I normally wear a size 0. So, if you're thinking about going up a size it would fit perfect! 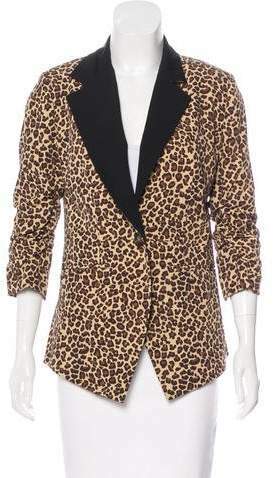 If you want to check out different leopard print blazers, I linked some similar styles leopard print blazers below. Let me know if you're feeling the animal print trend or not!